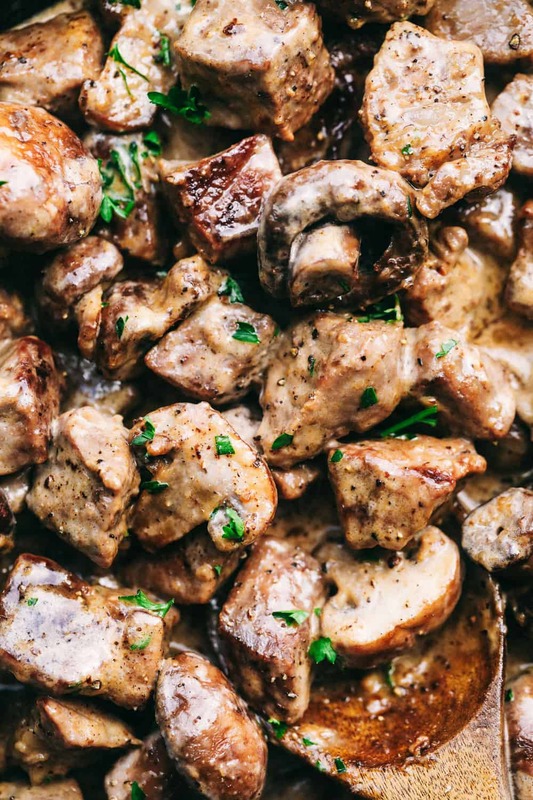 Creamy Garlic Steak Bites with Mushrooms are made in the most amazing creamy garlic sauce with melt in your mouth steak bites and mushrooms! We love steak at our house and these recipes are also our favorite! Skillet Garlic Butter Herb Steak and Potatoes, Lemon Garlic Butter Herb Flank Steak, or this Grilled Flank Steak with Avocado Corn Salsa! Holy yum! This meal was devoured by the family. 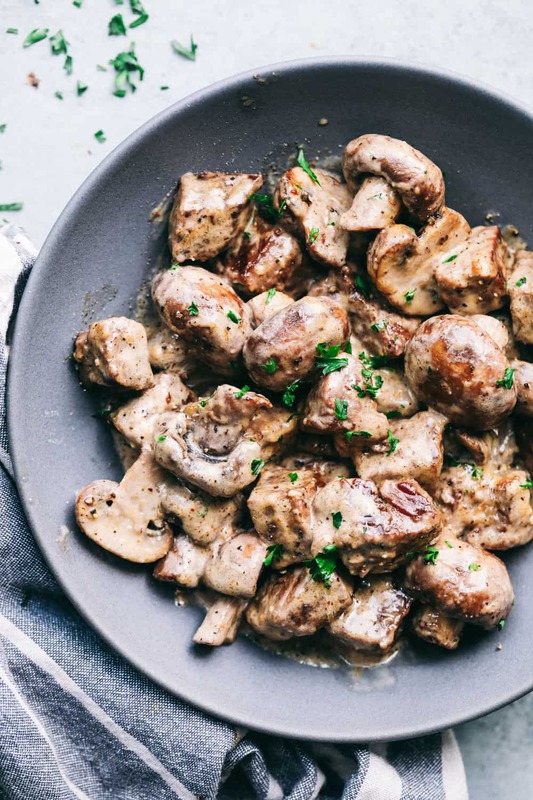 Is there anything better than melt in your mouth steak bites coated in a creamy garlic herb sauce with mushrooms!? I really don’t think so. Since school is back in session, I have been trying to come up with dinner ideas that are quick and easy. Since my family is all steak lovers, I decided to make this quick meal in the skillet. The family couldn’t seem to get enough of the creamy sauce and the tender steak bites. We served it over rice and served it with some veggies on the side. Easy peasy! 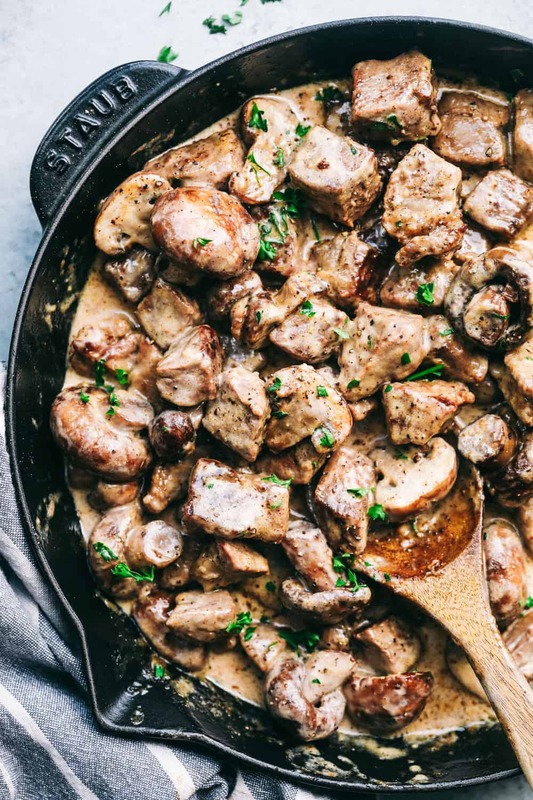 How do you make Creamy Garlic Steak Bites? To start, cut your sirloin steak into one inch cubes. Add 1 Tablespoon of olive oil to a medium sized skillet over medium high heat. Salt and pepper the steak bites and add them to the pan cooking them until they are golden brown. Remove the steak and set it aside on a plate. Add the mushrooms and garlic to the pan and saute until tender. Add in the heavy cream, shredded parmesan cheese, Italian seasoning, and salt and pepper. Add the steak back to the pan and allow to heat through and sauce to thicken. Serve over rice or pasta and garnish with chopped parsley. What other kind of steak can I use in this recipe? You can also substitute with a tenderloin, sirloin, or New York strip steak. What side dishes go well with this meal? This looks so rich and creamy! I can’t get over how yummy that sauce looks. I will need to stash this recipe away for the day that my kids will eat steak! Or maybe for a date night in. Hi Alyssa.. As always your recipes are wonderful..easy to prepare & the whole family loves them..We are coming into Summer here in Gold Coast Australia & again like the previous 2-3 years..we will again prepare & eat a lot of the meat & fish & pasta dishes you have delivered to us. Many thanks for all the delicious recipes..& we will continue to enjoy there recipes you send us through your blogs & emails.. Much love & Jah blessings to you & your familia.. This is so easy to make, and it’s very tasteful. My family loved it. I made it with “Top Sirloin beef” I will be making this more often. Thanks again for the great recipe. 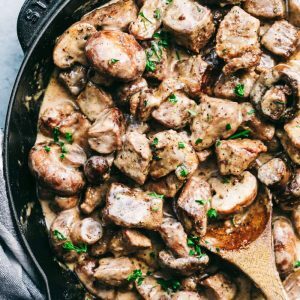 Mushrooms are a no in our house, What do you recommend as a substitute for mushrooms with this recipe? Hi! This looks delicious. Did you mince the garlic? THanks! No, they are cloves of garlic I added to this recipe. I wanted to ask did you chop the garlic or do you place the whole 3 cloves of garlic in the pan? Yes, I did mince the garlic. I made this last night. Delicious! I did add a little Cajun seasoning for warmth (and because I’m hooked on the stuff). Thank you! Yum… This was an absolutely amazing meal. It was very easy to make and because of that, I will be making this again. Is it possible to make this recipe in the instapot? If so, how? Yes! That sounds great! I have not made it in an instant pot but it can be done. Let me know if you try it. I made it keto friendly by serving it over mashed cauliflower instead of rice. Tasted great. Now I have to figure the fat, carbs and protein per serving. This recipe is a keeper! It is delicious and super easy to make! I served it over Jasmine rice and will be making it again for the fam. Thanks!